We couldn’t stop talking about how cool the windshield display was in the movie Mission Impossible 4 (MI 4.) It looked futuristic and practical enough to be included in everyday cars. Now Jaguar has gone ahead and made it a reality, not just that, it went ahead and created a connected car, that all other cars can now aspire to become. The car comes with a massive 8-inch touch screen. It syncs iOS and Android devices with the car through which you can instantly use the features on your phone on the cars infotainment system. The car also has an in-car Wi-Fi system that will let you use multiple devices connected through a mobile connection. It has roof mounted antennae to get the best network. To aid an easy interaction with the kickass system, the Jaguar has plain speech voice recognition and control. The car flaunts the Meridian Premium Audio for an incredible audio experience. The feature that will astonish a lot of folks is the Head Up Display, which is a high contrast, laser projected color system that will project the vehicle information on the windscreen without causing any distraction to the drivers. This panel is customizable to feature the information you need. Time for some MI4 levels of awesomeness in real life. The car comes with the ‘Incontrol Remote’ smartphone app which lets you stay connected with your car from practically anywhere around the planet. Using the app, the owner can set the climate control settings so that the car is at a pleasant temperature before the owner gets in. 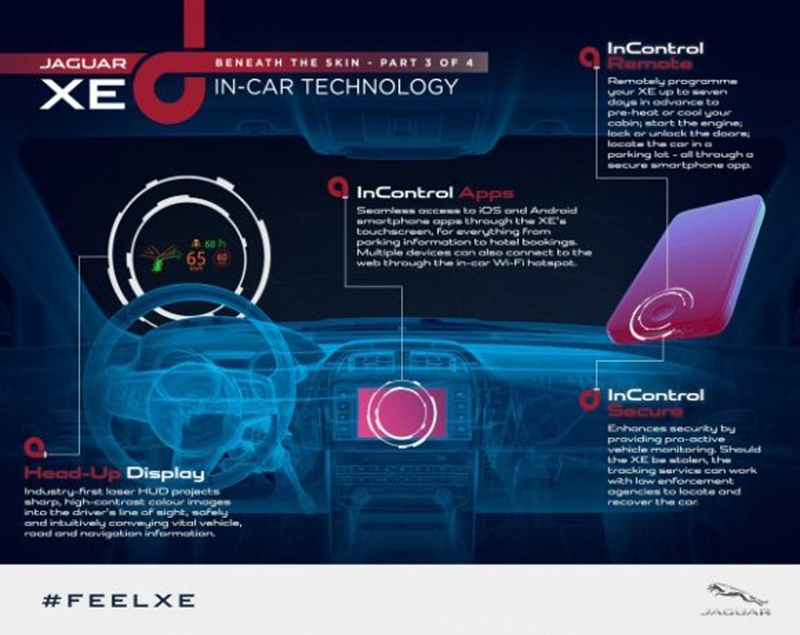 Jaguar XE also has some impenetrable safety and security features. The car has two features, the Incontrol Protect and Incontrol Secure. The Protect feature gives the option for an SOS call and optimized Jaguar assistance call that doesn’t require the user’s phone. The Secure feature lets the Jaguar team work in cooperation with law enforcement to locate and retrieve a stolen car. This will help address one of the major worries in the mind of the owner. Just watch the video and if you are a tech geek, then drool your hearts out.